Question: What were your first thoughts after having received the news that you are the winner of the European Vision Award 2008? Dr. Scholl: I felt very honoured especially because I am succeeding Prof. Frans Cremers who received the award last year. He is a world class basic scientist in the field of retinal dystrophies. Being a clinician scientist it may be difficult to compare the achievements and the implications they have for our vision research community. Dr. Scholl: All my research efforts may be subsumed as translational research in the field of retinal degenerations including monogenic retinal dystrophies and age-related macular degeneration. Phenotyping these diseases offers new insights that are relevant for developing therapeutic intervention. One example is high-resolution optical coherence tomography (sd-OCT) where we found unphagocytised debris between the photoreceptor layer and the pigment epithelium in patients with a cone-rod dystrophy due to mutations in MERTK. Using the prQuestionous technology, time-domain OCT, we did not detect such material. This is of importance since the phenotype indeed resembles the changes found in the corresponding animal model, the RCS rat, where gene therapy has been shown to be effective. Another example is fundus autofluorescence imaging that we use to investigate geographic atrophy, its progression, its risk factors and the success of therapeutic intervention. Question: Together with a multidisciplinary group of partners you have recently discovered systemic activation of the innate immune system in age-related macular degeneration. What are the implications of your findings? 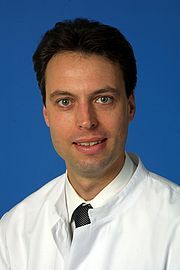 Dr. Scholl: After the break-through results of complex genetics in age-related macular degeneration (AMD), namely the finding that variants in the complement factor H gene confer risk for AMD, we hypothesized that the complement system may be altered systemically and the macula would simply the primary organ manifestation of such subtle but chronic alterations. Indeed we detected that markers of complement activation are increased in AMD patients and that the genetic variants were also correlated with the alterations on the protein level. AMD thus appears as a systemic disease and the macula as the anatomic area of primary susceptibility. However, I believe that we are still remote from any therapy that can be developed based on these findings. The complement system is a fundamental protein system of our body and the first line defence against microbial attack. Any modification may have severe consequences. Moreover, as with the genetic variants, simply an association with disease susceptibility has been shown. It remains to be shown that variants on the DNA or the protein level are associated with late stage disease progression, since patients seek medical help when they suffer from vision loss – and this is usually due to late stage disease. If such an association is not shown, prophylaxis will remain the only option. Question: How would you appraise the future in the field? Dr. Scholl: Developing safe and effective therapy requires big efforts both from academic and industrial research. The latter will always consider markets which show strong correlation with prevalence and incidence of diseases. Thus, progress can at first be expected in frequent diseases and by using therapeutic strategies with wide applicability i.e. that are effective beyond the disease under primary consideration. One example is fenretinide for late atrophic AMD. Its effectiveness was shown in ABCR knock-out mice which are the animal model for Stargardt macular dystrophy. However, this is a considerably less frequent disease than AMD, and this is certainly the reason that fenretinide is currently in a phase II study for late atrophic AMD. The potential benefit for Stargardt macular dystrophy may therefore be realised in a second step. Another example is aminoglycoside treatment for retinal dystrophies. Because there is considerable genetic heterogeneity amongst monogenic retinal dystrophies, pharmacologic therapies that are not gene-specific have significant appeal. Small molecule therapeutics, such as aminoglycosides, which target classes of mutation could therefore hold considerable potential as therapies for retinal diseases. Question: Which role has European collaboration for our vision research community? Dr. Scholl: Most research progress will depend on different expertises that are focussed on a common research aim. With the differentiation of knowledge, people having such expertise are typically spread over a given country and mostly beyond national boundaries. At the same time, research funding is becoming increasingly important and a critical mass of researchers has to be brought together to be successful. Therefore, European collaboration is crucial as ever and funding by the European Commission requires exactly this. In the competition with other research areas such as cancer or cardiovascular diseases we have to join forces to position our research area. The Question-Genoret project is a successful example for the mobilisation of the critical mass for the ambitious research aim of deciphering the functional genomics of the retina. We also need better coordination and communication efforts, and I therefore believe that the EuroVisionNet project is very much-needed. Question: How would you advise young colleagues who start their career as clinician scientists? Dr. Scholl: Some advices may sound trivial such as to simply speak with people who share a common interest in a research topic. However, multi-disciplinary discussion are rather an exception than the rule. People tend to speak to restrict their scientific discussion to people with the same background. I strongly advise to cultivate a multi-disciplinary interest and to enjoy to consider different perspectives of the research topic under consideration. As a clinician scientist you have to think in two directions: one is to evaluate the diagnostic or therapeutic potential of methods that are being applied or developed in basic science; the other is to identify the general research problems in everyday clinical practice. Question: Dear Dr. Scholl, we thank you for this interview and wish you all the best for your forthcoming research projects.